Home → Chemicals → Hillyard, Arsenal One, Spray Clean HD #20, Dilution Control, HIL0082025, Four 2.5 liter bottles per case, sold as One 2.5 liter bottle. The most aggressive ready-to-work spray and wipe cleaner we have ever made. 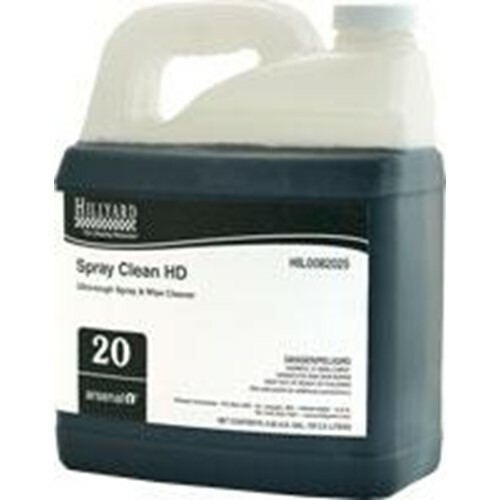 Spray Clean HD goes to work quickly to eliminate the toughest dirt, grease, and grime. It removes a variety of stubborn stains and marks such as fingerprints, rubber marks, lipstick, pencil, crayon, hair and body oils, grease, shoe polish, smoke film, and many others.